Partnership with bike shop and artists raises money for local charity. Crumpler Bags is joining forces with One On One Bicycle Studio and eight local and national artists to create a limited edition series of messenger bags featuring one-of-a-kind graphics. The custom bag designs are the centerpiece of a weeklong event called "Imaginary Bags," which culminates in a fundraising party featuring a silent auction to raise money for a local cycling-related charity. Gene Oberpriller, owner of One On One, says the idea for the show came together in a conversation he had with Crumpler Bags employees at last year's Interbike convention in Las Vegas. "One On One is a combination bike shop- coffee shop-art gallery, and we attract a pretty diverse group of customers. So we're always looking for ways to bring the local bike and art scenes together. A show featuring custom messenger bags designed by local artists was a natural." Oberpriller took the idea to Charles Youel, a Minneapolis advertising creative who's worked to stage other art and cycling events at One On One, including ARTCRANK, a bicycle-themed poster show. Youel put together a group of local and national artists to create designs based on the Crumpler Fux Deluxe messenger bag: Adam West, Aleks Stancevic, Amy Campbell, Katherine Lamm, Mary Fallon, Nicki McCracken, Sarah Nelson Forss and Steve Smith. He then enlisted the aid of fellow creatives Erik Kvalseth and Toby Balai, who came up with the "Imaginary Bags" theme and campaign, including a web site (imaginarybags.com), video email, posters and postcards. Youel also introduced the idea of making the event a fundraiser. "Last fall, a Minneapolis resident named Mark Loesch was killed while he was out on a bike ride near his home. Erik, Toby and I live in the same neighborhood and ride on the same streets. Right from the start, Imaginary Bags felt like a good way to do something positive for his family." 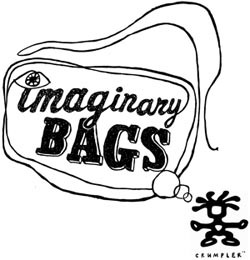 "Imaginary Bags" will open on Monday, June 2 at One On One, which is located at 117 Washington Avenue North in the Minneapolis Warehouse District. All of the messenger bag designs will be on display, and people will be able to place silent auction bids throughout the week. On Saturday, June 7, the event will wrap up with a closing night party featuring live music, a runway show featuring the bag designs, and a chance to help "design" a custom messenger bag with paintball pellets. At the end of the evening, the sixteen bags will go to the highest bidders, and all proceeds will go to the Mark Loesch Memorial Fund. According to Crumpler US Marketing Manager Bianca Dillon, "Imaginary Bags sums up the Crumpler marketing philosophy: Make some sharp-looking bags, throw a great party, and everybody goes home happy. In this case, we're especially pleased that it's being done for such a worthy cause."